time 8.00am everyday. Earlier times can be arranged. cost See below for details. Winner "Best Recreational Tourism Experience Category" West Rand Tourism Awards. 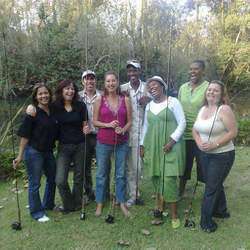 Fly-fishing, crab catching and picnics. 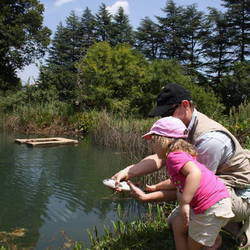 Adults and kids can come and fly-fish in the beautiful, natural surrounds of the Magaliesberg. 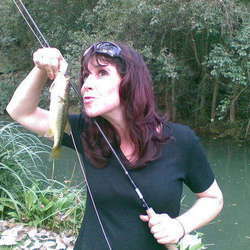 The fishing takes place in our lake (Trout & Bass) and the river (Yellowfish and bass). 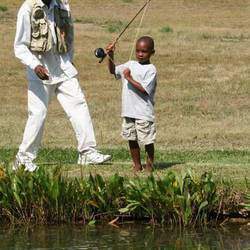 The fly-fishing lesson is simple and fun and will be enjoyed by adults and kids alike. We are located at Kloofzicht Lodge (Cradle of mankind World Heritage) & Magalies Barbus Haven (Magalies river Conservancy) and the water quality is amazing. 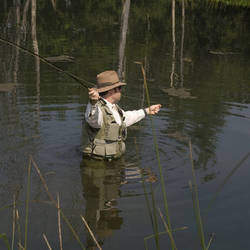 We include environmental awareness regarding fly-fishing. This is a great opportunity to spend some quality time with the kids in a beautiful surrounding not far from Johannesburg and Pretoria. 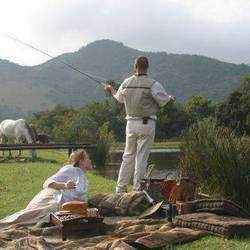 Plan a multi day trip and combine the fly fishing with many of the other exciting activities available in the Cradle and Magalies Meander. These include candle making, Maropeng, Hot air ballooning, Micro light flights, game reserves, Canopy Tours etc.